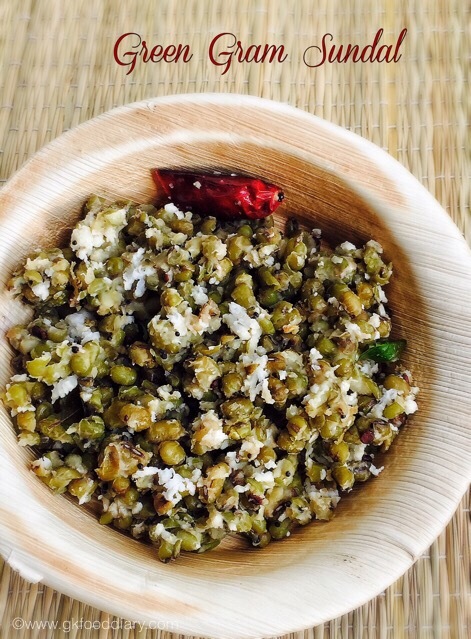 Green gram sundal / Green moong dal sundal is a healthy Sundal traditionally made for navaratri function. I have already posted the sweet green gram sundal. 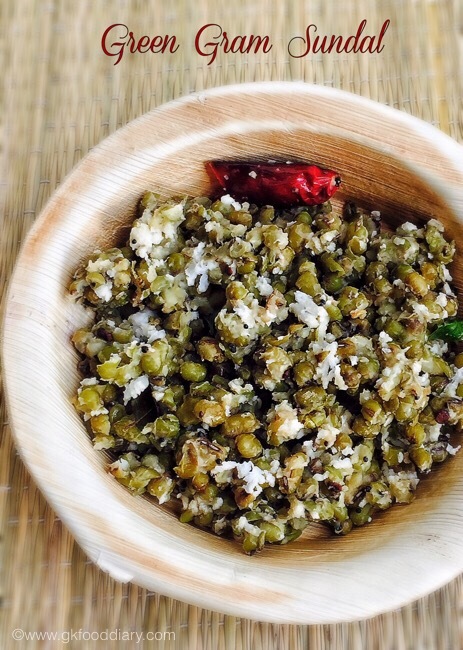 This recipe is the savoury version of green gram sundal. Hubby prefers savory version over the sweet version, but i like both the versions. 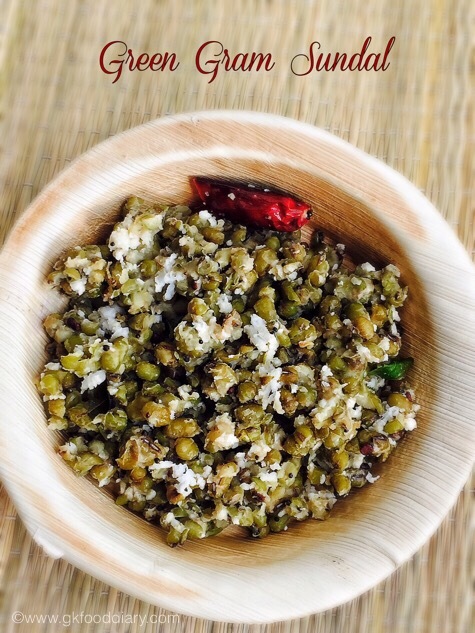 I make this green gram sundal recipe often as an evening snack as it is filling. My tummy never kicks for the snacks if i have this green gram sundal at the evening. 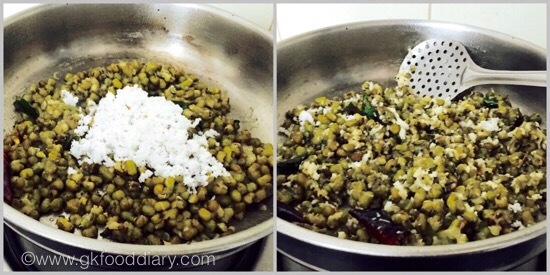 Here is how to make green gram sundal recipe, the savory version. Soak green gram with water at least for 7 hours or overnight. Pressure cook the green gram with water till it immersed level for 2 whistles. Open the cooker once pressure released by itself. Set aside. Heat a pan with oil and add the items to temper. Once the mustard seeds cracks, urad dal turns brown, add curry leaves and red chillies. Fry for a minute and then add pressure cooked green gram. Mix well. Now add grated coconut to it and mix slowly. Toss them for 2 minutes in medium low flame and switch off the flame once done. 1. 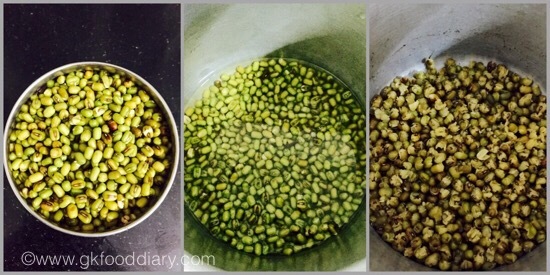 Soak green gram with water at least for 7 hours or overnight. Pressure cook the green gram with water till it immersed level for 2 whistles. Open the cooker once pressure released by itself. Set aside. 1. Heat a pan with oil and add the items to temper. 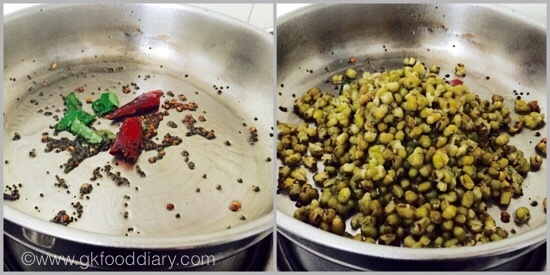 Once the mustard seeds cracks, urad dal turns brown, add curry leaves and red chillies. Fry for a minute and then add pressure cooked green gram. Mix well. 2. Now add grated coconut to it and mix slowly. Toss them for 2 minutes in medium low flame and switch off the flame once done. 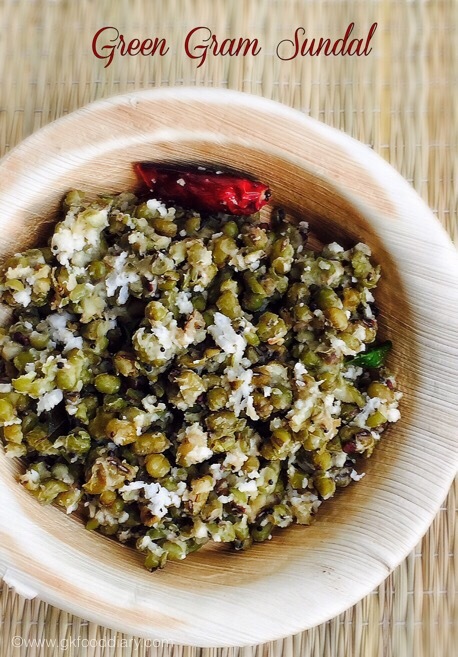 The healthy green gram sundal is ready! Green gram should be cooked soft but not too mushy. Instead of pressure cooking, you could boil the green gram with a cup of water in a vessel until soft.